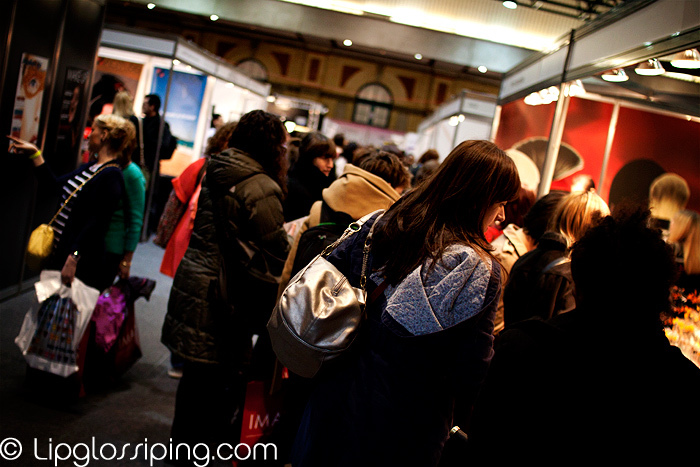 In just over three weeks, IMATS 2012 will touch down at London’s Alexandra Palace. This will be the third year in a row that I’ve attended the International Make Up Artist Trade Show and I can’t wait to revisit the brands that I don’t usually get the chance to see all up close and personal. It’s a fabulous weeked of artistry, shopping and education and this year promises to be better than ever with the news that the event has moved into Ally Pally’s Great Hall – a much larger venue adjacent to the event’s previous setting. One of my complaints about the previous shows has been the sheer volume of people crowding into the exhibition area, making it really tricky to get close to the stalls. The new venue offers literally over double the floorspace, so I’m hoping for a more relaxed shopping experience than previously encountered. A list of currently confirmed exhibitors for 2012 can be found on the IMATS website. Primarily and most importantly… IMATS is a trade show for trade professionals, though (with the exception of Friday 2-7pm) it is open to the general makeup-loving public. If you’re thinking of going and expecting to see all the brands you’re familliar with in Boots, don’t. It’s not Selfridges beauty hall. 1. Contact exhibitors in advance to find out if they’ll be stocking the ‘must have’ thing that you’re after. Don’t contact too early though, many won’t have decided what stock they’ll take/discounts they’ll offer until a few days before. 2. Set a budget, it’s easy to go overboard on the spends! 3. Wear comfortable shoes and lots of layers – I was freezing to begin with but roasting by the end of the day! 4. Arrive early to listen to the keynote speakers. 5. Get your shopping done first before taking the time to relax by checking out the demonstrations and chatting to the exhibitors. As for the keynote speakers, I’m really looking forward to hearing from Kevin James Bennett who will be discussing “Prep for Success” in assoc. with Embryolisse on the Saturday morning. You can buy tickets online or on the day (unless they sell-out in advance). Will you be heading to IMATS London on the 4th/5th February? Maybe I’ll see you there! I’m not going as 2012 is the year when I spend a LOT less of make up than the previous 3 years. That’s the plan anyway. I’m going Sunday, meeting up with some makeupalley girls, went last year and loved it. I’m not going this year as the one day ticket last year was £20 and this year it is £40. Plus the £10 for the travelcard. I’ve already spent that £50 on something I wanted – it went towards a new GHD iron ! I know all the products by now after the last 2 years so there probably won’t be much new stuff. Can get any hard to gets online anyhow.